Centre for Theology and University College, Melbourne VIC. and flow as our guides, we’ll invent modern expressive letterforms and explore issues surrounding verbal/visual legibility. The teaching of calligraphy in modern times has evolved around the idea that we learn from a model alphabet. In the UK this has been Edward Johnston's foundational hand while in the US, Italic alphabets have served as models. The thrust of this teaching has been "typographic." We present the alphabet as a family and teach single specific forms for each letter that are then repeated in the act of writing a text. In this class students will explore an alternative way of thinking about and learning calligraphy. 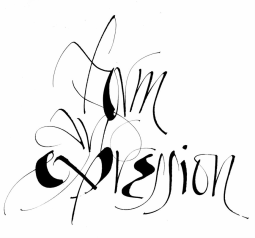 Rather than writing, we will look at calligraphy as drawing. Variation in form and the development of visual relationships and rhythms will be given emphasis. We will still learn from historic models. Two Roman cursive alphabets from the 5th century will be the foundation for the study. We will look at the alphabets, not to reproduce them as writing, but to get a feel for the idea of calligraphy as drawing. The study will also provide the foundation for the development of two new alphabets; a personal cursive handwriting, and a formal calligraphic hand. Legibility issues as well as other questions that will certainly arise form the study will be topics for discussion. “Words to be looked at” is the title of a book published in 2010 by Liz Kotz. It explores the use of language in 1960s art. In the context of many works of contemporary “expressive” calligraphy, the book seems relevant as it discusses artists who used words, but chose not to make statements with them. Calligraphy per se is not part of the discussions , but all the works evolve around the visual word with typography primarily used to make points about the visual properties of language. More importantly, for our purposes, I want to focus on the book’s exploration of the ideas that resulted from interdisciplinary dialogues between experimental music, avant-garde literature and poetry, and the visual arts. We will discuss and explore some works of artists from this period including John Cage, and Jackson McLow, as well as artists from earlier times who created visual expressions of the word. Paul Klee, Ben Shahn, and Mark Tobey are some names that come to mind. Their work, and other ideas relating to music and poetry will be used as inspiration for guiding the development of new calligraphic forms and compositions. We may even take a look at a few historic alphabets as a jumping-off point for creating new letterforms. As my description suggests, ideas about the class are in a state of evolution. You will need to think about the class as experimental and be willing to search without knowing how or where your work will lead you. I am always personally challenged by the words of Arne Wolf, one of my mentors, who said, “The urge of the artist is to do something different––to change change. For anything to be art it has to be new.” My idea with this class is to see if, by taking a kind of “sideways” look at some unique explorations by other art disciplines, we can develop original concepts that will forge new paths for calligraphy.